CogniSure Benefits | Does CogniSure Increase Brain Power? 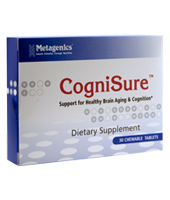 CogniSure, produced by Metagenics, is a supplement based on colostrum and is aimed at enhancing cognitive function as well as promoting healthy aging of the brain. CogniSure is only available in the United States through licensed health care professionals. The basis for CogniSure, colostrum, is a form of milk produced by mammals during the latter stage of pregnancy, often just prior to giving birth. Because colostrum is intended for newborns, it contains disease-fighting antibodies and was used to fight infection and treat disease before the advent of antibiotics. It also has a lower fat content and higher protein content than normal milk, though it is higher in calories. Additionally, colostrum contains proline-rich polypeptides, which show potential against various diseases and infections. CogniSure contains these proline-rich polypeptides as well. Promoting healthy aging of the brain. Reducing the buildup of brain plaque. Cognisure is thought to be a relatively safe supplement, with little to no side effects being reported in healthy individuals. Some individuals that are HIV-positive have experienced some side effects, such as nausea, vomiting, and a decrease in red blood cell count. Those with allergies to cow's milk or other milk products should stay away from products based on bovine colostrum. Because CogniSure is only available from a licensed health care professional, it gives potential users the opportunity to consult with their physician and determine if its use is right for them. How Does CogniSure Help Brain Function? Studies suggest that the proline-rich polypeptides found in CogniSure can function as a cognitive enhancer by improving long-term memory function. Users also report and increase in focus and concentration. Studies also suggest that it inhibits the formation of brain plaque, which is believed to be a major contributor to Alzheimer's disease. CogniSure is a way to boost your immune system and protect your brain from neurodegenerative diseases and should be considered after consultation with your doctor. Wondering about which brain supplements ranked better than CogniSure? Take a look at our brain supplement reviews!